The critically acclaimed BBC series, Blue Planet, has done much to highlight the incredible world beneath and beside our oceans. Narrated by Sir David Attenborough it educates and inspires, but it also tells a tragic story of how we are suffocating our seas. It is a story that is told for everyone, a warning that if we don’t take action we will destroy the life force of our world. 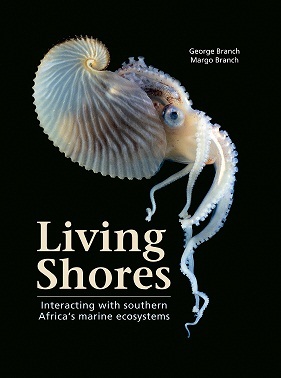 In their equally well-researched and definitive book Living Shores: Interacting with southern Africa’s marine ecosystem, authors George and Margo Branch take a passionate in-depth look into the forces that shape our seas and our coastlines. Over 300 beautifully illustrated pages, which take us from Beira to Luanda, through surging seas and rocky shores to estuaries, islands and the deep blue, are packed with just about everything there is to know about ocean dynamics and marine diversity. Originally published in 1981 and aimed largely at marine science students and teachers, the revised and reworked book was released in February this year. The authors, both lecturers, researchers and biologists, decided to update their book 37 years later as a labour of love, but mostly because so much more has been discovered and learned over the last four decades. As a long-time scuba diver, I share their passion for the sea and concerns for how we preserve and protect this incredibly rich natural heritage. Living Shores goes to great lengths to explain how our oceans work, why they are important, how we impact on them and what the challenges are in the future. It is more than just a textbook – although it does that brilliantly – but rather a testimony to the spectacular life that comes from the sea, from the seemingly lowly limpet to majestic humpback whales and everything in between. Did you know that the dusky cob rides the tides to save energy or that the African penguin population has reduced by over 90%? What about the theory that modern humans probably originated on the Cape south coast? Living Shores is packed with scientific data, but also fascinating facts that will appeal to a broader audience than only marine science students. It is not intended as a coffee table book, but its glossy pages filled with spectacular colour photography and explanatory illustrations and diagrams certainly lend themselves to being on display.